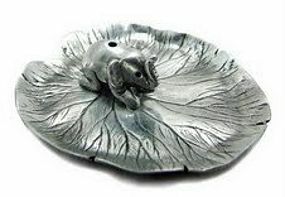 Pewter incense holder with an elephant on a lotus leaf. Size: 6 x 5.5 x 1.5 cm. 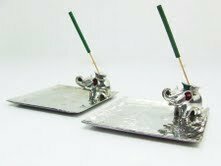 Attractive Pewter Letter Opener with a charming Elephant. Size: 0.4 x 6.1 x 0.7" inches. 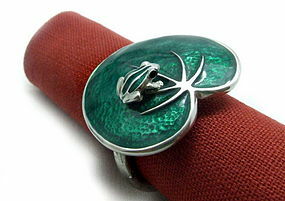 Charming Pewter Napkin Ring with an Enamel Green Frog on a Lotus Leaf. Size: 4.5 x 5 x4 cm. 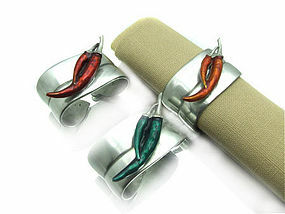 Amusing Pewter Napkin Ring with 2 Enamel Chilies (choice of red or green). Size: 2.5 x 5 x 3.5 cm. 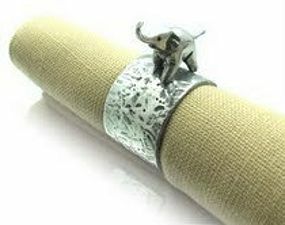 Attractive Pewter Napkin Ring with a cute Elephant on top. Size: 3.5 x 4.5 x 3.5 cm. 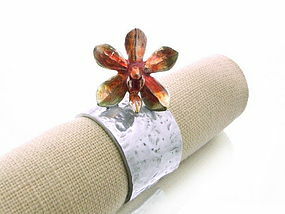 Artistic Pewter Napkin Ring with colorful Orchid blossom on top. Size: 4.5 x. 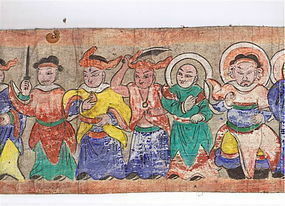 2.5 x 5.5 cm. 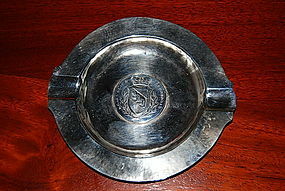 Charming Pewter Incense Holder Tray with Elephant. Size: 9 x 9 x 3 cm. 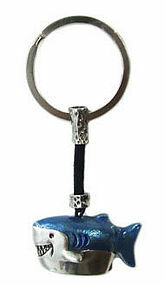 Cute Pewter Key Chain with colorful enamel Shark. Size: 4 x 8.5 x 2.5 cm. 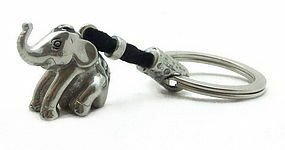 A very cute Pewter Key Chain with a colorful Enamel Whale. Size: 2 x 3.5 x 2 cm. 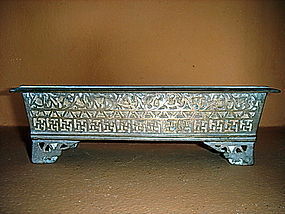 Attractive Qing Dynasty heavy alloy metal Bonsai Planter / Jardiniere with fret design. Rectangular shape, also suitable to place a Bonsai. Good condition. 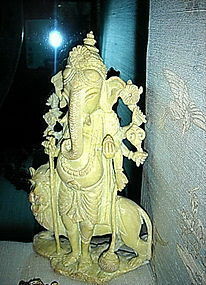 Size: L. 23.5 cm. x W. 13 cm. x H. 7 cm. 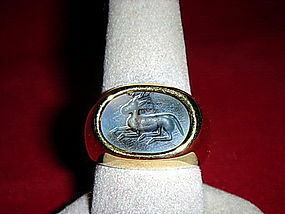 Origin: China, 19th Century guaranteed. 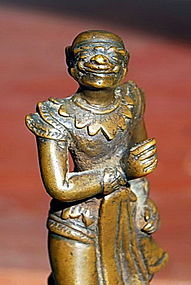 Finely detailed and rare massive/heavy bronze handle depicting the Thai Kumpakan Giant from the Ramakien (Ramayana). Very good condition, size H. 19 cm. x W. 5 cm. x D. 4.5 cm. Late 18/19th Century. Collector's item par excellence! 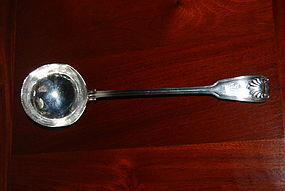 An elegant LONDON Victorian heavy/solid Sterling Silver Soup Ladle, Shell pattern. With hallmark/markings, maker is Chawner & Co. (George William Adams), Hosier Lane, Smithfiled, LONDON, 1840-1882. L. 13.5", Bowl W. 3.5" Condition: good overall, some signs of usage on right side of bowl and resting spot on back side of handle. Weight: 352 gr. 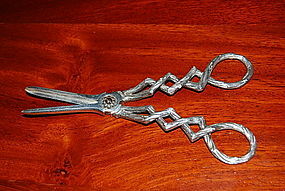 Beautiful solid Sterling Silver Grape Shears with LONDON Hallmark/Markings on both Blades. Maker: FH. Good condition. Size: L. 7". Weight: 121 gr. Very nice and rare SWISS Heavy Silver 800 Ashtray in a George V/Art Deco Design with a mounted numismatic RESPUBLICA BERNENSIS Coin in the center depicting the Crowned Arms of Bern. Marked on bottom C.O. 800. Condition good, one ding, minor signs of use. Size: 5.5" at widest point. Weight: 126 gr. Collector's item!